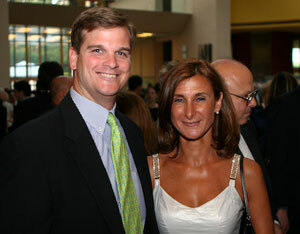 On Friday evening, June 1, 2007, the Embassy held a reception to celebrate the occasion. The event, held in “Piazza Italia,” as the main hall of the Embassy is often called, was attended by more than 1,500 guests, including numerous officials from Washington’s political, economic, scientific and cultural fields, as well as representatives from both the Italian and Italian-American communities. Guests were welcomed by Ambassador and Mrs. Giovanni Castellaneta, General and Mrs. Mirko Zuliani and the newly appointed Deputy Chief of Mission Sebastiano Cardi. 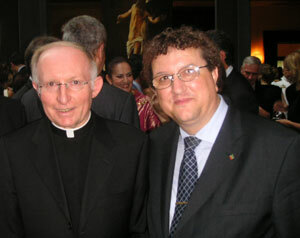 On Sunday, June 3, 2007, Holy Rosary Church celebrated Festa della Repubblica with a Mass celebrated by the Papal Nuncio to the United States, Archbishop Pietro Sambi, Father Lydio Tomasi, Monsignor Claudio Cricini of the Apostolic Nunciature, and former Holy Rosary Pastor Charles Zanoni. Among those who attended the Mass from the Italian Embassy were Ambassador Castellaneta, Minister Alberto Galluccio, First Counselor Marco Mancini, Military Attache General Zuliani, and a representation of uniformed military officials from the Embassy. Also attending the standing-room only Mass were representatives of local Italian American associations, as well as members of the COMITES. At the conclusion of the Mass, Ambassador Castellaneta delivered brief remarks praising the Italian-American community and in particular the Scalabrinian Order for their assistance over the years to generations of Italians who have migrated not just to North America but throughout the world.